Casa Amendoeira is a 4 bedroom Premier Villa located in Lagos, part of the western Algarve, Portugal. A delightful two storey property, Casa Amendoeira has recently been refurbished to a high standard. Set in colourful mature gardens high on a ridge to the east of the city of Lagos, this property also boasts views to the Atlantic from the balcony where you can enjoy alfresco dining. This Premier Villa is well located, with easy access to all local amenities. 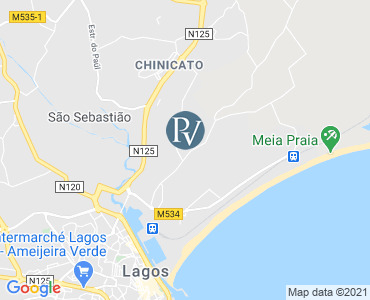 Beaches, restaurants and shops are all within walking distance, or a short 5 minute drive, including the beautiful sandy Meia Praia beach, making it an ideal Algarve villa holiday destination. To the west of the city, you will find the beaches at Praia D'Ana and Porto Do Mos, both with interesting rock formations and excellent for snorkelling. You will have a choice of four large supermarkets nearby for all your shopping needs. For golfers the excellent Palmares golf course is just a short drive. Lagos is a fabulous cosmopolitan and historic city, with narrow cobbled streets in the old quarter which offers many street cafes to choose from to stop for a leisurely lunch or dinner. There is a great selection of nightlife comprising bars, clubs and many excellent restaurants. The Lagos marina also offers a further selection of restaurants and cafes, as well as tour operated services such as cruises, fishing and boat trips. Lounge and dining room, with french doors to dining terrace with electric awning. Kitchen with fridge/freezer, microwave, oven and separate hob, dishwasher. Double Bedroom with en-suite and terrace. Two Twin bedrooms with both with en-suite facilities. All Bedrooms on this floor have access to the mid level terrace, with steps down to the pool terrace. Between October and April pool heating equipment may not be able to heat the pool to a comfortable temperature. All prices are per week for the villa only. Villas are booked from 15:30pm on your arrival day (Thursday) to 10:00am on your departure day (the following Thursday). Please note that availability shown is subject to confirmation - please call our reservations team.